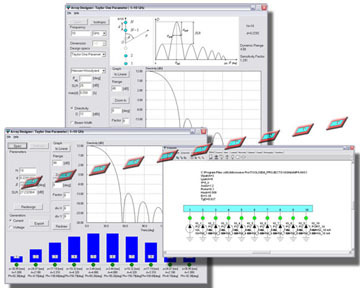 Array Designer is an add-on tool for WIPL-D Microwave, which helps design antenna arrays. For a given array element 3D EM model and radiation pattern specification, Array Designer computes (1) amplitudes and phases of feeding signals and (2) distances between array elements. In addition, at each design step, array factor is visualized. Array Designer creates the best possible initial array design, with minimum number of elements. After obtaining the initial design, the user can interactively adjust design parameters and instantly see the updated array factor plots. Currently, Array Designer provides Uniform amplitude, Windowed (featuring 15 window functions), Dolph-Chebyshev, Taylor, Schelkunoff, Fourier transform and Woodward-Lawson distributions for linear equally-spaced arrays. Both voltage and current excitations are supported. For an arbitrary user-specified array element 3D EM model, Array Designer generates a parameterized schematic. The schematic representation of the antenna array performs full 3D simulation on-the-fly and is suitable for analysis and optimization in WIPL-D environment. WIPL-D Microwave’s powerful Smart Simulation feature greatly reduces simulation time for 3D EM models of large arrays. The user-friendly interface greatly improves design efficiency and offers design flexibility, which makes Array Designer a useful tool for RF/microwave engineers and practitioners. Schematic representation performs full 3D simulation on-the-fly and is suitable for analysis and optimization in WIPL‑D environment.